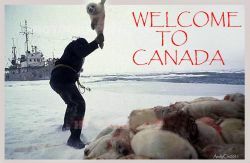 March 17, 2012 is the DAY OF ACTION for SEALS in Canada. Despite the disappearance of the market for Canadian seal products, and the plethora of international boycotts against the largest massacre of marine mammals on the planet, Stephen Harper plans to implement what amounts to a bounty on East Coast seals this year. 100s of thousands of 14 day old baby seals will be hacked, bludgeoned, and shot to death or left to die from their injuries on the ice or in the water. Even the sealers want out of this one. The president of the Canadian Sealers' Association indicated that there was already a stockpile of over 400,000 seal pelts and room for no more. Seals killed this year would be left to rot on the ice or in the water. Sealers would receive a bounty for every life taken, but the seals will not be used for meat or clothing. Join us in demanding an end to the horror that is the Canadian seal hunt, stand with us at the protests, or send an email to Fisheries Minister Keith Ashfield at min@dfo-mpo.gc.ca and demand a halt to this horrific assault on juvenile wildlife. If you want to organize an event in your community, please feel free to use the images above for posters. Let us know if you are having an event and we will share the information. Humane Society International, Atlantic Anti-Sealing Coalition, Ottawa Animal Defense Group, International Fund for Animal Welfare and many more. Minnesotans are planning a seal demo 3/17, 11:30am-1pm. in front of Canadian Consulate General - Minneapolis - 701 Fourth Avenue South! Come and join us!